Recently, I faced a major dilemma. There was a LARGE piece of cheesecake in front of me and no one else to eat it. Not to bore you with the details, but, let's just say a certain child of mine decided he didn't like it. I happen to love cheesecake. Hey, they named a factory after it! Snack Girl never talks about "good" or "bad" foods or "guilty pleasures". I talk about treats. A slice of cheesecake can set you back 733 calories, yowza. That is a mega treat right there. I still wanted to find a way to eat cheesecake and enjoy it without picturing the consequences to my hips. Call me crazy but I want to have my CHEESE cake and eat it too. The first issue with cheesecake is portion size. You really don't need a 1/2 pound slice to get a satisfying amount of cheesecake. So, I busted out my muffin tins. Regular cheesecake is made with cream cheese, eggs, sour cream, and sugar. I wanted to see if I could cut some of the fat and sugar out of it without ruining the taste. By using Neufchatel cheese, which is a lighter form of cream cheese found next to the cream cheese, and 1% cottage cheese, I created a very nice flavor and texture. I did use a mixer for this recipe because I used cottage cheese. To get the lumps of cottage cheese to incorporate in the batter you do need a mixer or a very strong arm. 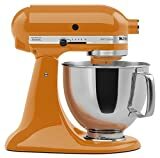 My husband (when I wasn't looking) purchased a stand mixer from Kitchen Aid (see below). If you do a lot of baking, this is a great tool. I don't use it as much as my Cuisinart, but it comes in handy when making birthday cakes. One of those $15 hand mixers from Walgreen's will work with this recipe - don't freak about not having a $300 mixer. Give this a try and tell me what you think. I think it is a brilliant way to enjoy cheesecake. Preheat to 325 F and place rack in center of oven. Place muffin tin liners into muffin tin and add one cookie to each liner. Mix all of the remaining ingredients until smooth with a mixer. When ready, add two tablespoons of batter to each muffin cup. Bake for 10-12 minutes until firm in the center. Serve room temperature or cold with a few blueberries or a sliced strawberries. Cute idea with the Nilla wafers! Sometimes when I'm in a dessert mood and it's only breakfast time, I mix cottage cheese, vanilla, honey, and a dash of lemon juice - tastes kind of like the filling but without baking/etc. Yours sounds like a real (mini) dessert! So far I have loved your ideas. But seriously your cheesecake recipe did not have to have nilla wafers in it!! You of all people know what kind of stuff must be in those things. Am I wrong? Was there no healthier alternative? Or maybe possibly how about a crustless cheesecake? I am just saying. I love the blog and love your ideas. Cheers! I often have my Wine Tasting hosts make a recipe similar to this when pairing with dessert wines. This way, they don't have to break the bank with an expensive cheese cake and the portion sizes are just enough for a taste to go with the wine. Can't wait to try your version! If you're concerned about the lack of health value in store bought vanilla wafers (or the possibility of say, MSG in the natural flavor), you can make them at home. I would try graham crackers, crushed for the crust instead of wafers. 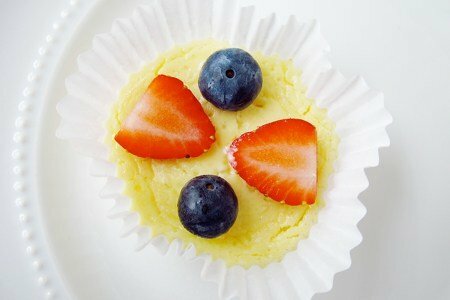 I love individual cheesecakes, that are healthy! I make them all of the time. I never thought of using cottage cheese, I normally use yogurt! Wonderful recipe! That was really interesting and innovative recipe. Thanks for sharing. Awesome recipe!!! I think this recipe sounds great and I will be making it soon. Thank you! If you put cottage cheese in a blender, it changes the texture to something very similar to sour cream and that can also be useful in recipies. I love cheesecake! But its a trigger for me. I found I can make the Jello cheesecake sugarfree pudding add some fruit and a sprinkle of graham cracker crumbs and it helps my craving. Again -- it's disturbing to see a post that looks to "low fat" as a winning ideal. Healthy fats are an extremely vital part of a healthy diet. I understand that we're talking about a dessert here (not anything daily) but to make a healthier version, let's begin with healthier whole foods and not look to lowering the fat content as if that is a solution. Of course Nilla wafers aren't ideal either, but that's another story. I do appreciate your shared journey. I've seen a drastic change in the type of foods you're eating/trying in the past year or so. I always value your willingness to try and reinvent the (snack) wheel! Love the idea except for nilla wafers. Currently pregnant for the 2nd & final time. I only crave cheesecake when with child. I am very overweight & struggle w/ gestational diabetes. Nothing is harder for me than eating just right when I'm low on energy & "high" on cravings. Cottage cheese is a nutritional staple for me in these times. Thank you! I will definitely try this when I get home from vacation. It sounds like a fun treat to make. I wonder - can they be frozen? I want to clarify - I do not believe low fat is the way to a healthy diet. The choice here of Neufchatel - which is naturally low in fat - and 1% cottage cheese - is to bring down the calories in a treat. If it didn't taste good to me, I wouldn't post the recipe. As for Nilla wafers, you don't need them to make this work - I just used them because they are easy to find and round. Forget the cookies or just make it with a graham cracker crust - it is up to you! That's why it's a treat! I will use the low fat Nilla wafers. I'm in pretty good control and losing, and have had no problem with them; I can't say the same of all foods, though. I made the little cheesecakes last evening. Very enjoyable. Thanks Snack-Girl, now I know what I'll be taking to my book group this weekend; a great alternative to the rich and tempting desserts that another member brings!